In the radio documentary, Let the Good Times Roll, Mickey Baker told producer Lex Gillespie that “[If it wasn’t] for the blues, we’d all be sitting around sipping tea and listening to chamber music.” Baker, who died on November 27 at 87 at his home near Toulouse, France, knew from chamber music (he studied classical composition with Iannis Xenakis), but it was blues that suffused his music, whether it was the pop, R&B, or jazz that he was called upon to play as a session man, or his concerto, “The Blues Suite,” which he composed for guitar and orchestra. 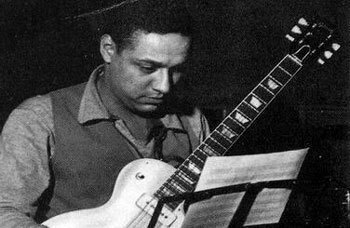 In a few short years, Baker became one of the most renowned and in-demand of the legion of sidemen and session guitar players whose tasty fills and propulsive chords added immeasurable appeal to the work of singers, saxophonists and harmonica players in the post-WWII era. For every headlining guitar-slinger like T-Bone Walker, B.B. King or Albert King, there was an unheralded Carl Hogan with Louis Jordan; Clarence Holliman or Wayne Bennett with Bobby Bland; Pat Hare with Junior Parker; Louis Myers with Little Walter; Eddie Taylor with Jimmy Reed; and Robert Jr. Lockwood with Sonny Boy Williamson. Baker owed his household name status to “Love Is Strange,” the million-seller he recorded with his guitar protégé Sylvia Vanderpool for Groove Records in 1956. Les Paul and Mary Ford were models for Mickey & Sylvia, who were together for a couple of years before they made “Love Is Strange.” The song reached #1 on the R&B chart and #11 on the Pop, and was soon covered by Buddy Holly and the Everly Brothers, and over time by Kenny Rogers, Sonny & Cher, Paul McCartney and many others. Years later, as Sylvia Robinson, Vanderpool founded Sugar Hill Records and produced the hip hop prototype, “Rappers Delight,” while “Love Is Strange” went on to soundtrack immortality in “Dirty Dancing” and other movies. The tune’s origin is as wonderfully convoluted as anything in modern popular music. Baker’s guitar riff is remarkably similar to one played by Bo Diddley on Billy Stewart’s Chess single, “Billy’s Blues,” and Bo apparently copped his from Chicago bluesman Jody Williams. Williams was touring with Diddley in ’56, and Mickey & Sylvia were part of the package too. But Diddley not only played the lick, he wrote “Love Is Strange,” and made an unreleased demo of it for Chess Records in 1956. However, because he was in a publishing dispute of his own with Chess, he credited the tune to his wife, Ethel Smith, and encouraged Mickey & Sylvia to record it for the RCA subsidiary Groove on October 17 of that year. 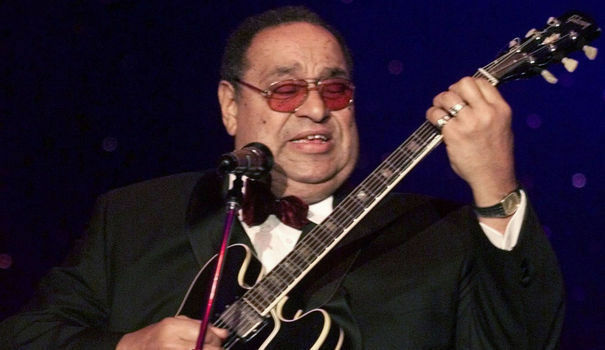 After the song came out, Arc Music, the publishing arm of Chess, sued, claiming it had been copied from their man Diddley’s playing on Billy Stewart’s single. The copyright infringement suit lasted four years and found that “Love Is Strange” had not plagiarized “Billy’s Blues.” Nevertheless, reissues of the recording have since credited Baker, Robinson, and Elias McDaniel (Bo Diddley) as its co-composers. Mickey & Sylvia continued their run as a duo for a few years but “Love Is Strange” was their only big score. It wasn’t Baker’s last appearance in a memorable duo, however. In 1960, it was his voice and guitar that Tina Turner engaged with on “It’s Gonna Work Out Fine.” The song was a million-seller for Ike & Tina, and a Grammy winner to boot. Baker’s voice is unmistakable on the studio original, but Ike steals the show in this amazing live television footage. I’d like to think that royalties from “Love Is Strange” and the Jazz Guitar books brought Baker the measure of security that was abjectly missing from his childhood, but Herrington’s photo suggests that even in the South of France, he was still a tough customer who never lost the edge that made his guitar playing ring and rock and reverberate.